Can I just say I’m ecstatic to have another sized jar? 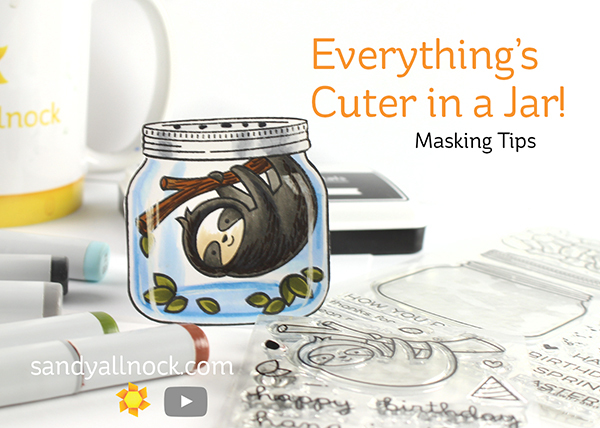 I’ve been using THIS one for a while…but now more things fit in a jar since we have this cute little chubby jar! Today’s video isn’t a coloring one – but so many have been asking for more info on masking that I thought I’d show a few examples. These aren’t tips with fluids (see this post for a test of liquid friskets) – but with sticky notes and masking tapes. And of course adorable Lawn Fawn images – see the supply list for all the sets shown. Watch the video below or click HERE to see it in HD on YouTube. 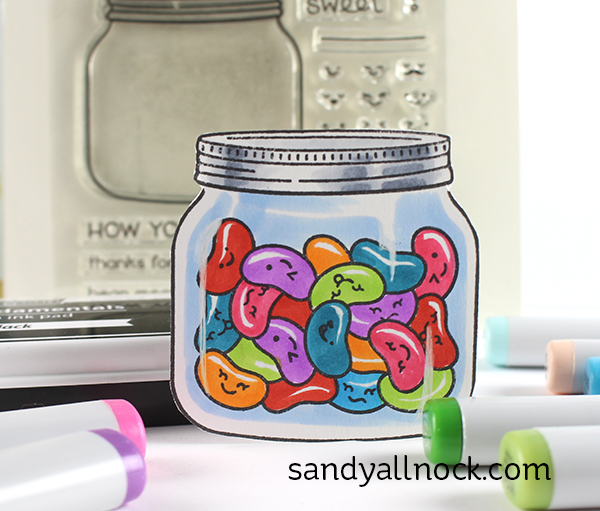 You can also make your own bean arrangement, add labels – lots of options. 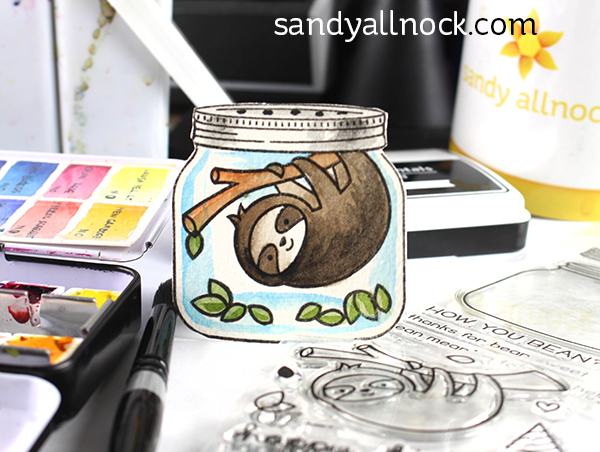 When I saw the fat jar, I checked right away to see if the sloth would fit – and it did! And a few others – Baah Humbug (upper left), Sewn with love (upper right), Out of this World (lower left) and Meow You Doin (lower right). 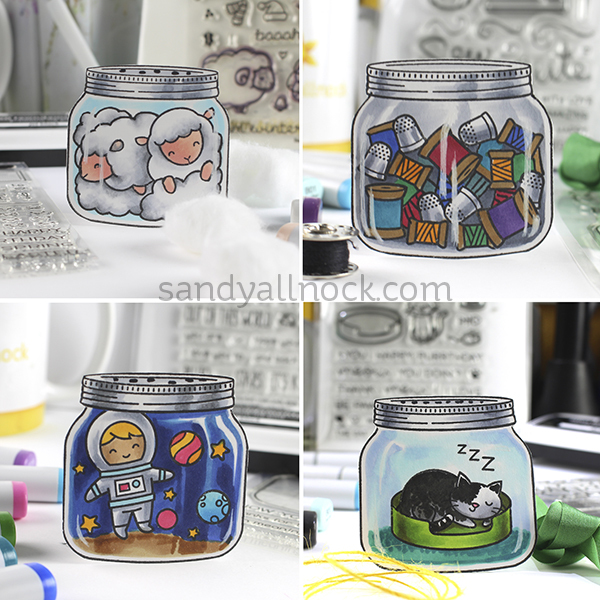 These are a few of the jars I’ve created in the past – the tall jar is from Bugs and kisses, and I put the owls into the Gumball from Sweet Smiles! What a great video Sandy,thank you! I’d also love to know how you did the glass effect,because it makes the jars look so lifelike! Is it on the inside or outside of the jars? How do you put it on? Really cute. Did you watch the video where I showed how? 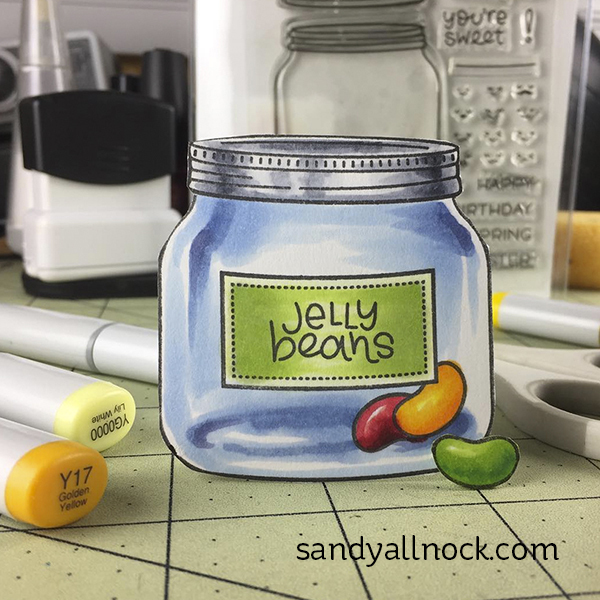 Love the video–I have a jar stamp–will look for unusual things to fill it. Would love to know your technique for creating the glass effect on your jars. Genius, sandy! I love it. The sewing one in my favorite. Would love to see how you color the glass. They look so real. You’re amazing!! These are so adorable! Put all of the cute things in jars!! I never knew so many wonderful things could fit in a jar! Love them all! These are adorable… so cute! Funny and cute. Love the look and will try this idea.. after I get a jar. I love the sloth, thanks for the great idea… I will try some real soon! Too cute. Masking is always a challenge for me but you made it look easy. I’m going to try the tape thing. So cute! The napping kitty in a jar is my favorite! Great ideas, Sandy! Thank you for another jar video! Awesome class site, it’s very user friendly too. Thanks for all your hard work, now I need to get back in and work on my classes more. I have too many fun things that divert my attention at any given time. And I love the theme of the items in the jars. Such a unique idea, so much fun! If you hadn’t purchased a class, there’s no account for you already. Just create a new one. Thanks for the masking tips! I reset my password and logged in. I love it! I tried to upload an avatar photo but couldn’t get the link to work. I’m looking at the hex chart class for my next course. Thanks for today’s lesson! I was able to upload an avatar from my laptop. Thanks! I must be doing something wrong since I don’t see a blog post? click on ‘blog’ in the menu. I knew I got this set and I knew there was a reason why. You always show me to think outside the norm. I think I got most of the new Lawn Fawn release! How fun and cute is this? ♥ it! Excellent video. I tend to avoid masking because I feel it’s too much work and too complicated but you make it look easy and straightforward. I might have to give it a second chance. I love the sheep in a jar :). Thank you for the lesson.